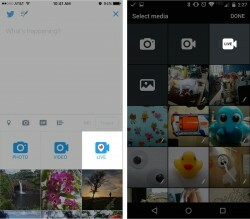 Nothing has taken the social media world by storm recently quite like live streaming videos. Tumblr is the most recent platform to jump on the live stream train following other sites like Twitter, YouTube and Facebook’s lead. Social media is all about ‘in the moment’ content and engagement. We look at our newsfeed’s most recent updates to see what our friends are up to and even have to look at our Snapchat within 24 hours before content is dismissed as irrelevant and disappears forever. It’s really no surprise everyone has been so intrigued by live content. Of course live videos are not exactly new; websites like Ustream and Livestream have been around since 2007. However, now that live streaming videos are so rapidly being integrated into social media platforms, it has opened new opportunities for artists to engage with fans and integrate live streams into their marketing campaigns. With all the live streaming video options popping up and all the attention these features are getting, we thought we would put together a guide to help you understand and take advantage of live streaming videos as it becomes more and more important. There is something about the urgency and immediacy of the word “Live” that gives us some serious fear of missing out. Seeing a live stream makes people more interested in going to the event in the future. When Coachella first started to live stream their festival in 2011, tickets sold out in a matter of days; the following year they took advantage of streaming, they sold out in a matter of hours. It is not only events that receive great benefits from live streamed videos. The personable, intimate and engaging feel these features offer has become very intriguing for fans. Doing this makes fans feel they are getting something special and raw and inspires trust that recorded videos just don’t offer. It is a way to make fans feel like they know the artist personally and it is no secret that the closer fans feel to an artist, the more invested they will become in the artist’s career. Last, these social platforms that host live videos are prioritizing live streamed content over any other content so the reach for these videos is most likely to be much higher than any other post you will create. For instance, Tumblr is putting live videos to the top of everyone’s news feeds and Facebook Live allows fans to follow live streams and have notifications sent every time the page goes live. Facebook Live has also made it easy to invite friends to watch the stream, whether they follow the page or not. What do you live stream about? Q&A: The best part about live streaming is the ability to talk to your fans in real time. Tell fans to ask you questions and they will appear on the page for you to answer and talk directly to them. Behind the scenes: Give fans a sneak peak into the recording process of your album or walk them around the set of a music video. You can also go live while sound checking and getting ready for a show. On the scene: Live stream at your concerts. No need to live stream the entire show but a few songs will be enough to make fans wish they were there, so that next time they get a chance they will be sure to buy a ticket. Track by track: When you have an upcoming album release, take fans through the inspiration and writing process behind each track. This will spark up conversation with fans as they reply with questions about each track you can answer to create an engaging atmosphere. Announcing news: For any juicy information your band is ready to share with the world, a live video is a great way to go due to the massive reach these videos have. Pick a platform that best suits the artist and situation. Take into consideration how many followers each platform has and how engaged those followers have been in the past. If you plan in advance, warn fans of the stream so they can be ready and not miss the opportunity to interact. Then as you go live, remember to respond to comments to make this as interactive as possible. Twitter: Use the app Periscope to go live on this platform. When creating a new tweet there is a “live” button that will take you directly to Periscope to start broadcasting. YouTube: YouTube’s live streaming is hosted through Google’s Hangouts on air. Click on events on your YouTube Page, fill in the information required and then you’re free to go live! Check out a step-by-step here. Facebook: Go to the mobile app, click “Whats on your mind” at the top of your news feed, click “Live Video” and add a description. When you’re ready, simply press “go live” and you will be given a 3-second countdown until you are live on your page. Find more here. Tumblr: Oh so many choices. You can now use YouNow, Kanvas, Upclose and YouTube to create live streams through this platform. Whichever you choose, create an account and make sure it is linked to Tumblr. Then go live and if all is properly connected, it will be shared through your Tumblr page. Get further information on Tumblr’s help page. You mentioned that there is something about the urgency and immediacy of the work “Live” that gives us a more serious fear of missing out. My wife sent me a video of our cat interacting with our dog and it was hilarious. Are there certain apps that work better for longer videos as opposed to the shorter videos? Finding a live broadcasting app might be a good idea.